When mini quilts started to become popular I have to admit I really didn't get it. What was the point? Not big enough to lay under or spread on the back of a couch, too big to put your mug on. The idea of hanging them on a wall like an unframed picture just didn't appeal to me. 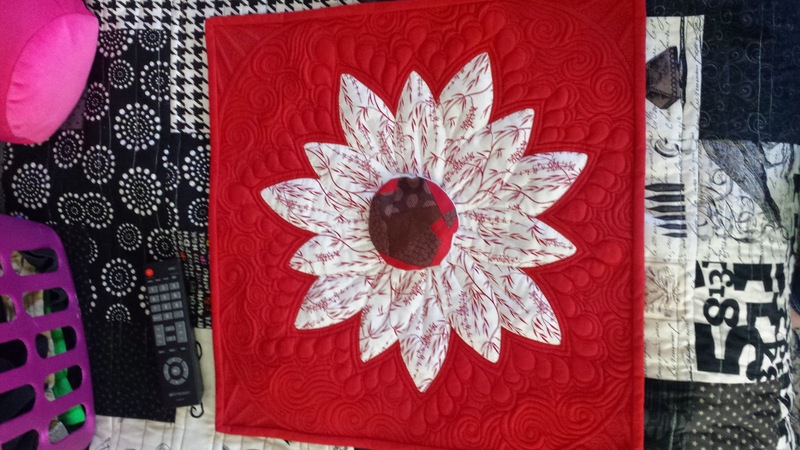 So I watched skeptically as they spread over the quilting world. 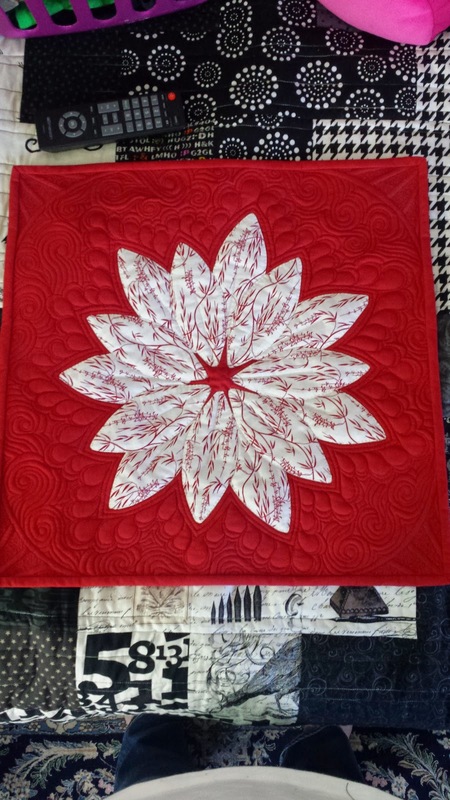 But then I set a goal to improve my free-motion quilting and realized that minis are the perfect way to accomplish this! So I exercised my female prerogative to change my mind and made a couple. And now I get it! They are like the cuteness of a cupcake compared to a whole three layer job. 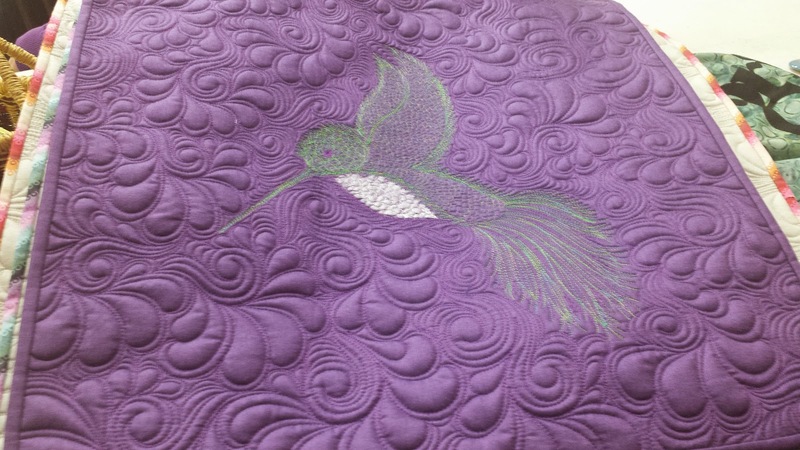 And it is so much easier to concentrate on mastering the motion and speed of quilting without wrestling the bulk of a large quilt. 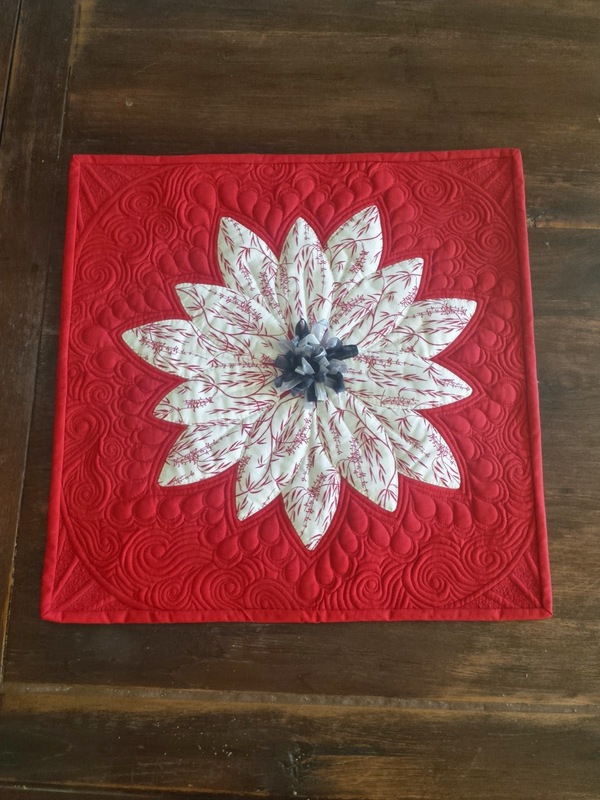 I put it together from some orphan blocks and scraps I inherited from my ex-step-mother-in-law (yes my husband's family is complicated) Robyn. So it went together pretty quickly. Here is the back. Some fun batiks in a pretty blue palette. I wanted to work on piano key boarders and miter type corners. I also tried some fun things inside the center blocks. She had also given me some advice on how to do feathers and those cool swirls so I gave them a go. I thought about leaving the center as it was. But it just didn't look right. 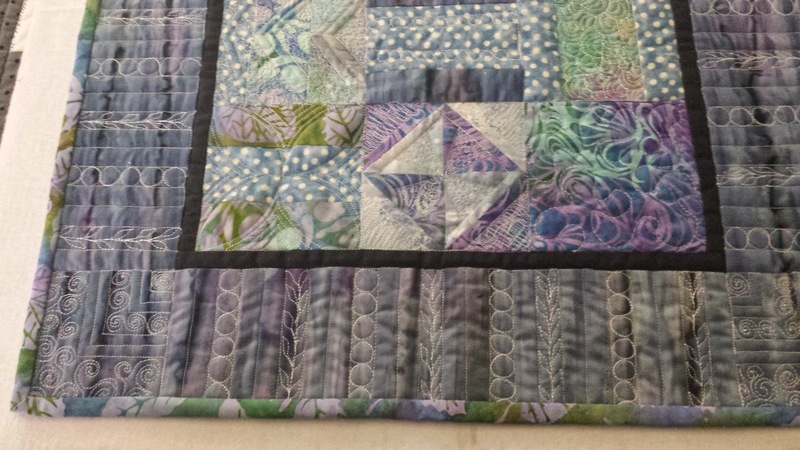 That's when I got the idea to grab a spool of variegated ribbon I had and tack loops down to the center. 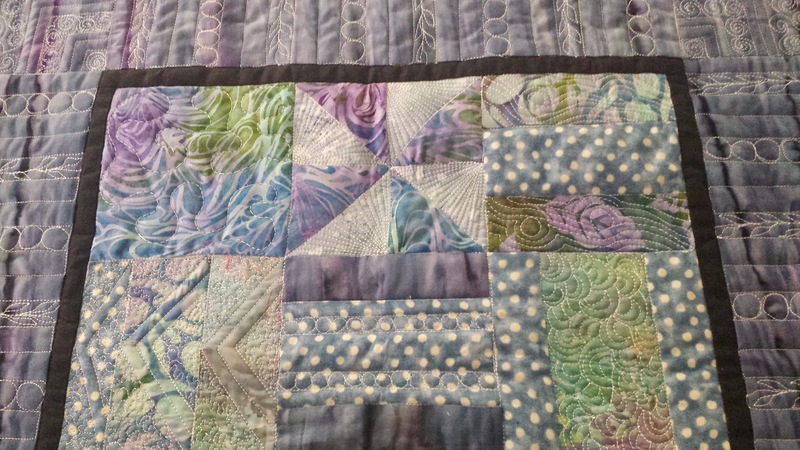 I love the extra texture it added to the whole quilt. I've also been practicing hand binding on these minis. 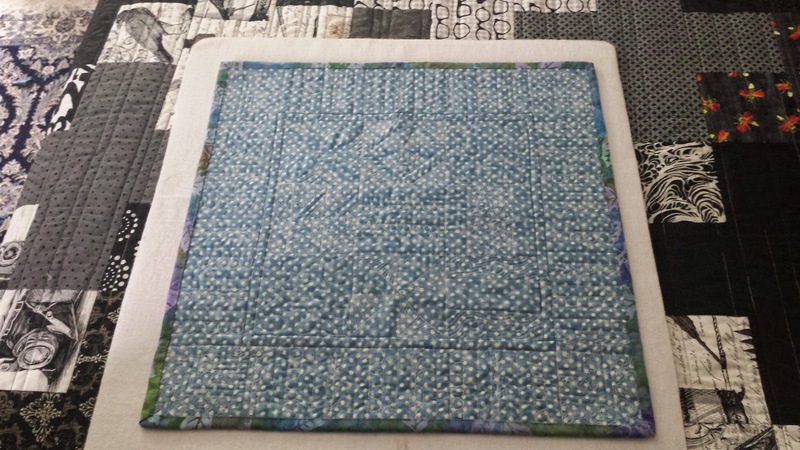 I machine bind all my quilts and love how quick and secure that is. 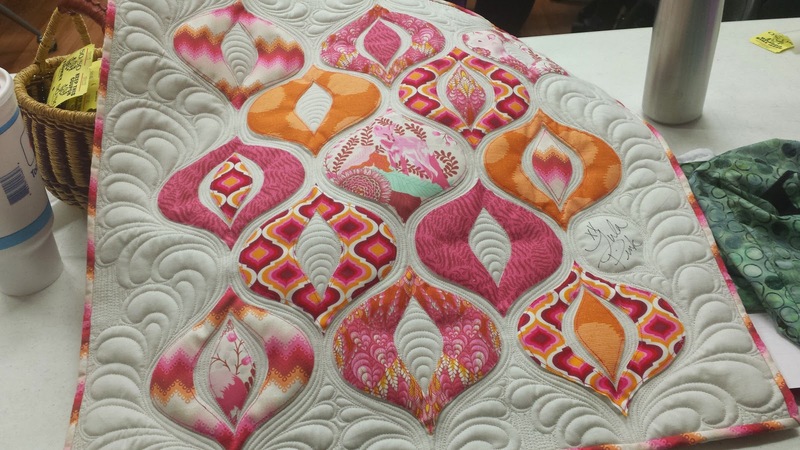 But I know that if I want to eventually enter my quilts in larger shows I'm going to need to hand bind them. I kind of hate doing that but with a mini at least the torture is short-lived. I also used a different kind of thread on this mini. I've always used cotton thread. 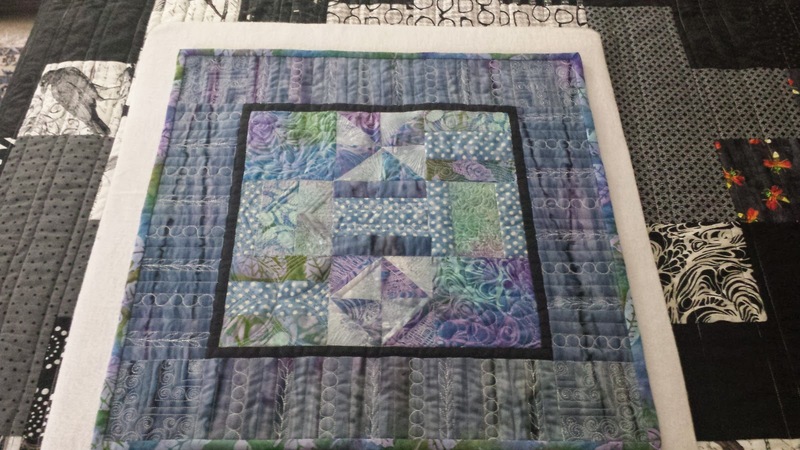 Usually Gutterman or Connecting Threads and sometimes Aurifil. But I had purchased some polyester Superior thread from my friend Christa Watson of christaquilts.com. Among them was a lovely red. It was 60 weight thread called The Bottom Line. And it worked like a dream! It has a nice shiny sheen to it and didn't shred or break once! I'm pretty sold. So there you go - my first two minis. The blue one became a birthday gift for a dear friend. The red one is hanging on the wall over my sewing machine. And I'm already thinking about my next one.